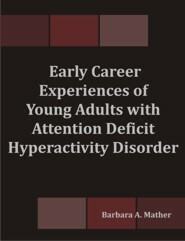 Barbara Mather, Ph.D., is an expert in the area of ADHD in adults. In addition to her ongoing interest in helping young adults with ADHD in the workplace, she is an experienced management consultant in the area of organizational change management (OCM) and has owned a successful consulting business since 2002. As President of Mather Consulting Group, Inc. (www.matherconsulting.com) Barb works primarily with Fortune 500 companies, helping them to achieve organizational success through change management and communication strategies. Barb’s educational background includes a Ph.D. and M.A. in Human and Organizational Systems from Fielding Graduate University, an M.B.A. from Drexel University in Philadelphia, and a B.S. in Business from the Rochester Institute of Technology. She is a Certified Management Consultant® from the Institute of Management Consultants (IMC). Additionally, through a two-year California State University (Dominguez-Hills) program, she obtained Community College Teaching Certification and is qualified to teach in California community colleges.